Did you know that May is Osteoporosis Awareness Month? Osteoporosis awareness month is sponsored by the National Osteoporosis Foundation. Statistics show that about 10 million Americans have osteoporosis and 34 million are at risk for becoming osteoporotic. 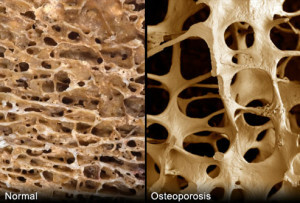 Over half of all American women and about ¼ of men over 50 will break a bone due to osteoporosis. While hip fractures are commonly associated with osteoporosis, patients also can have fractures of the vertebral body resulting in pain and a worsening of posture. Osteoporosis is a growing concern for many of us as we age. Bone is made up of 3 parts; collagen a protein that gives bones a flexible framework, minerals like calcium and phosphate which make bones strong, and cells that work to either build up bone tissue or break it down. Changes in bone density are due to bone cells either reabsorbing minerals within the bone like calcium for other cellular functions or storing these minerals in the bone tissue making them stronger. Osteoporosis is a condition of low bone mineral density so great it places our bodies at risk for fracture and is measured by dual-energy x-ray radio absorptiometry (DEXA) scan. 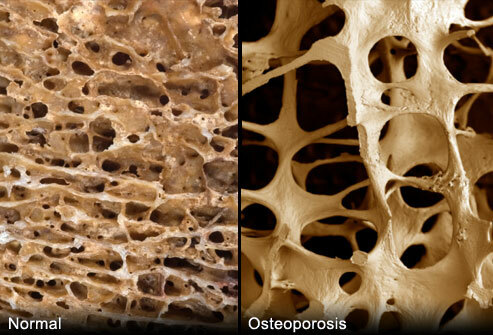 Osteoporosis occurs because too much minerals are taken out of bone instead of stored. This can be due to changes in body hormones and a reduced stress on the skeletal system. The keys to maintain healthy bones are found by understanding some basic physiology. Bones, like muscles, respond to loads or stressors placed upon them. If you consistently place a large stress on your bones the cells will respond by storing up those minerals that make the bones stronger. For this to happen you have to have minerals available for your cells to use. This is why some foods are fortified with Calcium and Vitamin D so we are giving our bodies what they need to function. I am not a fan of fortified foods and am of the opinion that we should be getting calcium from foods that have naturally high amounts of it. Drug therapies for osteoporosis have never shown great benefits without potentially severe side effects. The most commonly prescribed medication today is a class of drugs called bisphosphonates. While studies show these medications improve bone density, sometimes only minimally, risks of prolonged use remain high. In a lot of cases doctors discontinue the use of these medications after 5 years of use. The decision to engage in drug therapy for osteoporosis is something that should be made only after a serious discussion with your doctor regarding your individual need. The best way to improve bone density is through strength training. Regularly placing a substantial load on your muscles and bones will cause both to grow stronger. Do not confuse a regular cardiovascular exercise program with strength training. You cannot improve your strength by running, cycling, or taking an exercise class alone. We all must strength train properly and regularly by not doing this you are not doing everything you need to do to stay healthy and fit. Before starting a strength training program you should get with your doctor to make sure you are healthy enough for it and then develop a plan that is based on your level of fitness and your goals. For the past two years we have been a BStrong4LifeTM center which has not only helped us do more to help the spinal health of our patients but it also gives us a way to make an impact on bone health. BStrong4LifeTM is a program that incorporates stretching, balance training, and strengthening. We utilize whole body vibration platforms by Power Plate and an isometric strength training unit by bioDensity. This program is designed around the fact that muscles and bones respond better to a short duration of maximal load. 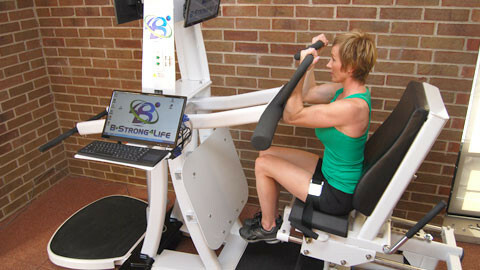 With BStrong4LifeTM patients generate a max load in four positions for a short time frame. Over time strength improves, as measured by the computer, and bone density increases. Patients in our office have noticed increases in bone mineral density as well as functional improvements in their daily lives. Presently the BStrong4LifeTM corporate office is undertaking a research study examining the effect on this program on bone health. The preliminary data has shown increases in bone density up to 11% after one year’s use. Osteoporosis is a growing concern in our aging population but we can avoid and treat it by improving our nutrition and by exercising regularly. With BStrong4Life our office is uniquely equipped to make a huge impact on bone health. If you are interested in learning more feel free to give us a call we would be happy to help you.